It’s that time of year again- Happy Cinco de Mayo everyone! While this year the holiday sadly falls on a Monday, there’s no reason why all of us can’t interject a little celebration in to our routines! 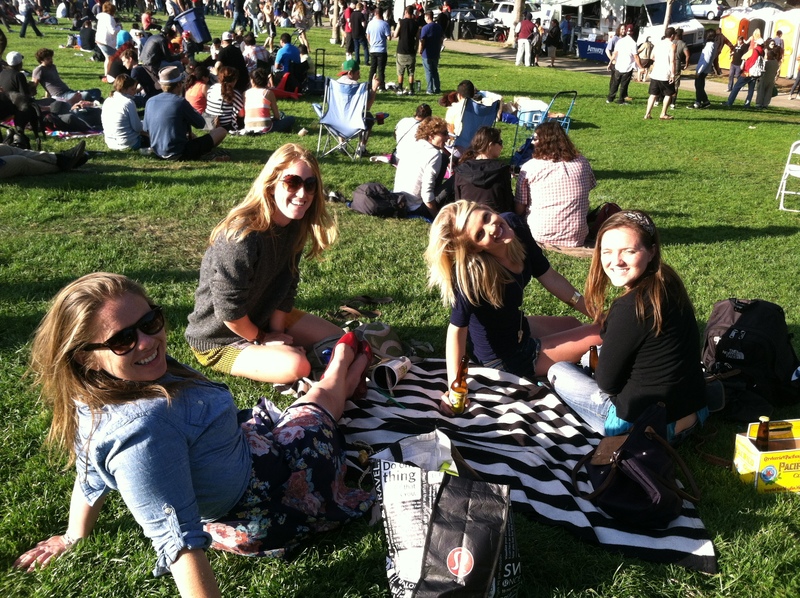 I had fun looking back at a Cinco de Mayo celebration in infamous Dolores Park that my girlfriends and I had last year. This particular day is distinct in my memory, because it also happened to be the day my dear friend Brooke announced to us over Facetime that she was expecting! I got especially squeaky over the news that I was going to get to be some little bean’s crazy aunt. 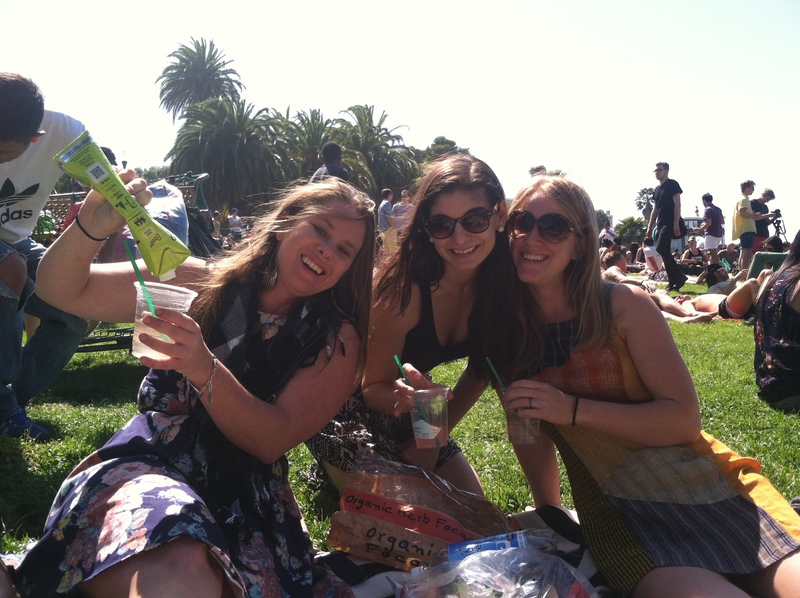 It was a beautiful, but windy day, so we packed up a delicious picnic (courtesy of Trader Joe’s!) and headed over to the city. Somehow, I’m not exactly sure why, this park allows all kinds of behavior that would otherwise be frowned upon anywhere else in San Francisco. This “anything goes” mentality also makes it amazing for people watching, because suddenly, somehow, this park abides by the same laws as Las Vegas. Just make sure you don’t sit next to the group of nudists, and keep an eye out lest you get smacked in the face by a wayward hula hoop. Oh, and please use the public restrooms. That is the only time I’ve ever seen anyone be reprimanded by the police for their behavior there. Cheers to a beautiful view! This particular holiday also marks the creation of a signature cocktail, which was brought on by the discovery of decent white wine in a box. In honor of the holiday, we called it: Cinco de Wino. Yes, very creative. Now, if you’re a wine connoisseur, you’ll want to stop reading. If you don’t mind adding saccharine, artificial things to your beverages, you’ll probably enjoy this. 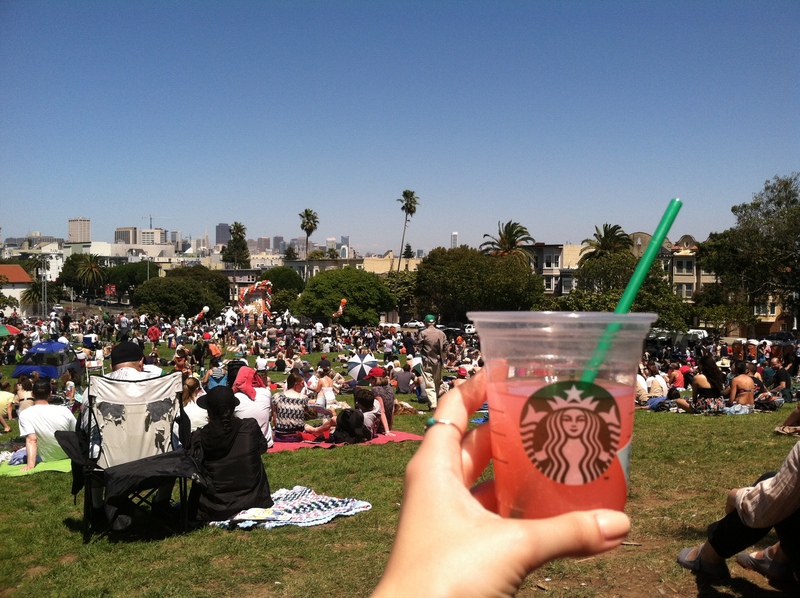 It’s a sangria on-the-go! Over ice, simply combine white wine, pink lemonade (we used instant, Crystal Light powder…) and a sparkling beverage of your choice. In this case, it was lemon flavored sparking water, but you could potentially substitute your favorite soda, or even a sparkling wine. The ratios depend entirely on your own preferences, so experiment away! It’s the beginning of summer marked in a glass. Or, if you’re resourceful/environmentally friendly, in a reused Starbucks cup! We’ve created many iterations of this drink over the year, and it’s quite portable and delicious. Again, if you’re a purist, you could certainly make this a more “highbrow” cocktail. Just….eliminate the powered, concentrated ingredients and perhaps substitute limoncello? It’s really up to you. Now go and enjoy!